For the grand finale of this series of posts on spy novelist Jeremy Duns – whose third spy thriller starring British double-agent Paul Dark, The Moscow Option, was published in the UK on Thursday (it'll be out in the States on 29 May in an omnibus edition alongside the first two Paul Dark novels) – something rather special: an exclusive Q&A with Mr. Duns. The interview was conducted over email earlier this week, and those familiar with Existential Ennui will doubtless be unsurprised to learn that the questions are very much books-orientated – partly because books – reading, collecting, publishing – are indeed the focus of this blog – and Jeremy is, after all, an author – but also because I believe that what we read as a child and what we read as adults can offer insights into who we are as people. In that respect, then, I feel Jeremy's answers are quite revealing, as he discusses the books he read as a kid, his schooldays, and where and how he discovered spy fiction. 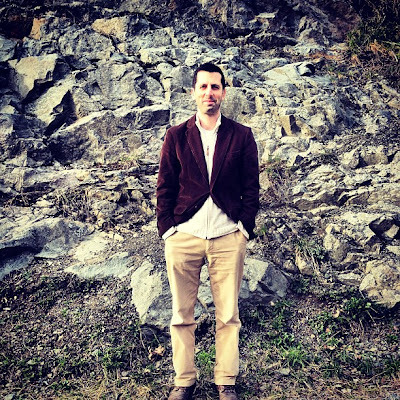 NICK JONES: What is your earliest reading memory? Either being read to, or reading for yourself? JEREMY DUNS: My earliest reading memory is of my mother reading me I See Sam and Dr, Seuss books. She was an English teacher so she was keen to teach me to read early. My earliest memory of reading for myself is discovering a cupboard at home that had boxes of spare books from my mother's class. One box was filled with pristine copies of a book called Emil and the Detectives, and I took it out and sat on the carpet and read through the whole thing, entranced. I don't remember much about the book except for that feeling of being swept away in a story, and wanting to read more as a result. Can you recall the first book you bought yourself? Or at least the earliest one you can remember – what it was, where you bought it, why you bought it? I feel I should remember this, but I don't. It might have been Curtain by Agatha Christie. When I was eleven or twelve I started reading Christie's novels because my parents had a few, and I quickly became addicted to them and began seeking them out. I've never been a book collector, but at that age I was determined to read all of Christie's work, and she had written dozens of books. I didn't read all of them, but I read all of the Marples and Poirots, and Curtain was the last Poirot to read. I loved Christie's twists, and Curtain didn't disappoint. I did a lot of my reading as a kid at the local public library. I know you grew up in Nigeria and Malaysia and so forth, but I believe you went to boarding school in England. Did you have access to a library? Were you an avid reader? I was a total bookworm as a boy – I had enormous round glasses and looked like Harry Potter. I went to prep school at eight, a place called Horris Hill in Berkshire, and one of its alumni is Richard Adams. I remember being told that the seeds of Watership Down had been sown at the school when he told other boys stories about the rabbits on the nearby down after lights out in his dormitory. I didn't tell stories after lights out, but I did read long into the night with my torch under my blanket, usually things like Jennings and Darbishire and Just William, then Agatha Christie when I got a little older. At thirteen I went to Winchester – after I'd talked at great length in my interview about Hercule Poirot – and there was a library in the boarding house that seemed to have stepped out of Tom Brown's Schooldays. It had a copy of that book, which I read, as well as P. G. Wodehouse, John Buchan and dozens of comic legal thrillers by Henry Cecil, which I chomped through. It also had several paperbacks with distinctive yellow spines and the name of the writer in thick black lettering: Dennis Wheatley. I was too young for his occult stuff, and have never really been interested in horror anyway, but I loved his Gregory Sallust spy thrillers, despite their rather dubious politics. I reread them a few years ago and it was like travelling back in time to my fifteeen-year-old self. 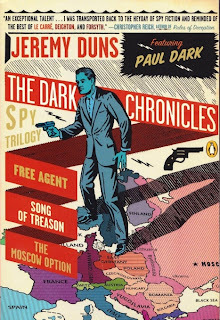 Incidentally, I thought it was interesting that Song of Treason, your second Paul Dark thriller, hinges in part on a past, painful humiliation at boarding school. Was that informed by personal experience? I don't have much in common with Paul Dark – I can't kill someone with my bare hands, even if they're guilty of plagiarism. But I realized when writing Free Agent that his background would most likely mean he went to a public school. As I went to one, I thought it made sense to capitalize on that and use what I knew about its peculiar ways and customs to bring him more to life. I enjoyed my schooldays, but I was fascinated by aspects of it, such as the power prefects held – I remember there was a rumour that under the previous housemaster the prefects had occasionally run amok and destroyed people's possessions overnight. I watched Another Country at school, and felt that the basic dynamics of life in such a place hadn't changed for decades. I didn't realize until years later that Julian Mitchell had gone to Winchester, so there were probably reasons it seemed so familiar. When it came to Song of Treason, I thought it wouldn't be too difficult to insert some of my knowledge into an earlier era without it seeming anachronistic – it had already seemed anachronistic when I experienced it. My own Notions test was unremarkable, but it had quite a build-up, which I suppose is vital with any initiation ceremony. You heard, and imagined, all sorts of things. The parts about waiting in the library in his dressing-gown and being disoriented as he is led around the house are from my own memories. Much of the rest is imagined, and some is from hearing others' experiences. There was an incident with someone getting Deep Heat in his eyes, and although it wasn't damaging in the long term, at the time it seemed monumental. I tried to take these experiences and make them real for Paul Dark and the other characters in an earlier time, in a more dramatic way. The idea of someone carrying over humiliation at school into adult life is not uncommon in thrillers (or perhaps life), but I thought the 'local knowledge' I had would make it more vivid and interesting. Although it might not get me invited back for Sports' Day. While we're on the subject of Song of Treason: you also put Paul Dark through a torture sequence, in the grand tradition of Ian Fleming's Casino Royale, Len Deighton's The Ipcress File, Adam Hall's (alias Elleston Trevor) The Berlin Memorandum and others. Bit of a weird question, but were you keen to have your own torture sequence in one of your novels? And how do you think your one stacks up? There's a great conversation between Raymond Chandler and Ian Fleming that was broadcast by the BBC in 1958, in which a rather sozzled Chandler asked Fleming why his novels always included a torture scene. Fleming replied that he grew up reading Sax Rohmer's Fu Manchu and Sapper's Bulldog Drummond, and that in those stories it was traditional for the villain to capture the hero and drug him or make him suffer in one way or another. My first exposure to this sort of scene was in Dennis Wheatley's Sallust novels, where there's a recurring villain, a senior Gestapo officer called Grauber, and the torture scenes were often horrific. I had written an interrogation of sorts towards the end of Free Agent, but I thought it was time I had a proper spy thriller torture scene. It fitted into some of my research about the political situation in Italy at the time, but I also felt that a torture sequence that played with public school initiation ceremonies would make sense for the novel. I'm proud of the scene, but I don't think it compares to the ones in those three books, of course – they're classics of the genre. I did get into music a lot more, but I carried on reading. As well as Agatha Christie and Henry Cecil, I remember reading John Christopher's Sword of the Spirits trilogy, which I loved. This was in the library, I suppose because it was set around Winchester, which made it more interesting, of course. But it also had a fantastic twist, which I'll spoil now so be warned: it seems like it's set in the past, in some Arthurian England, but partway through you discover that it is in fact set in a post-apocalyptic future, where the priests are secretly controlling technology. I guess I like twists. As well as Dennis Wheatley, I read a lot of Alistair MacLean, Desmond Bagley, Frederick Forsyth and Jack Higgins. Jeffrey Archer, of course: copies of Kane and Abel were handed round like samizdat (and always seemed to open on the same page). There were a lot of thrillers from the Sixties and Seventies floating around: Hammond Innes, Geoffrey Jenkins, Duncan Kyle, that sort of thing. In my late teens, I read a lot of Julian Barnes and Iain Banks, and became more interested in literary fiction. I read in an interview that you didn't really discover spy fiction until you were in your twenties, when you chanced upon some spy novels in an Antwerp bookshop on a journalistic assignment. Were they paperbacks? Can you remember what they were? I did read spy novels when I was younger – my parents had a rather obscure novel, The Left-Handed Sleeper by Ted Willis, which I enjoyed, and after that I discovered Len Deighton and John le Carré. But I did a degree in English literature and read very few thrillers at university. So when I walked into that bookshop in Antwerp I hadn't read any spy novels for a few years, and wasn't especially interested in them. But there was a whole bookcase of second-hand thrillers in English, and a lot of them were spy novels. 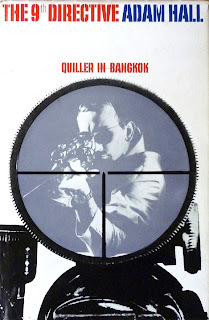 I picked up The Quiller Memorandum by Adam Hall. The title was vaguely familiar and I saw it had been made into a film. It cost next to nothing. I picked out three or four other books – I don't remember what they were – bought them, and went to do an interview with a fashion designer. I was impressed by The Quiller Memorandum, but it didn't blow me away. But I found another secondhand bookshop in Brussels that had several more books in the series, and The Tango Briefing had me hooked. I'd never read anything like it. I'd never imagined a spy novel could be so exciting but so beautifully written. So then I started reading a lot of spy fiction. I can usually recall where I bought the books that are most important to me. Is it the same for you? Where are some of the places you've bought books? I lived in Brussels for several years, and there's a wonderful second-hand bookshop there called Pêle-Mêle – anyone who knows me has heard me rhapsodize about it. It used to have an extraordinary collection of secondhand thrillers in English, but I suspect it doesn't anymore as several hundred of them are now in my bookshelves: sorry! I just cleaned the place out over the course of a few years. I mainly buy from second-hand bookshops. I always visit the Charing Cross Road area when I'm in London, although the pickings are a lot slimmer now. I'll stop at any flea market, in any country, and check their selection. There are a few good places in Stockholm, where I live now, but these days I do most of my book shopping online, which is less interesting but means I get what I'm looking for. Physical bookshops are for the discoveries. I've got a silly amount of guidebooks I've bought 'just in case': if I ever want to write a thriller set in Mauritius in 1976, I'm prepared. There are a couple of fantastic second-hand bookshops in Rome, which I mention in the author's note for Song of Treason: I remember being in the back room of one over a decade ago and finding a copy of Encounter from 1965. It had an article in it by John le Carré in which he wrote about James Bond being a capitalist hyena and ended by suggesting that the Russian Bond was on his way. That was an important find for me, and I still read the article every now and again to remember the effect it had on me. 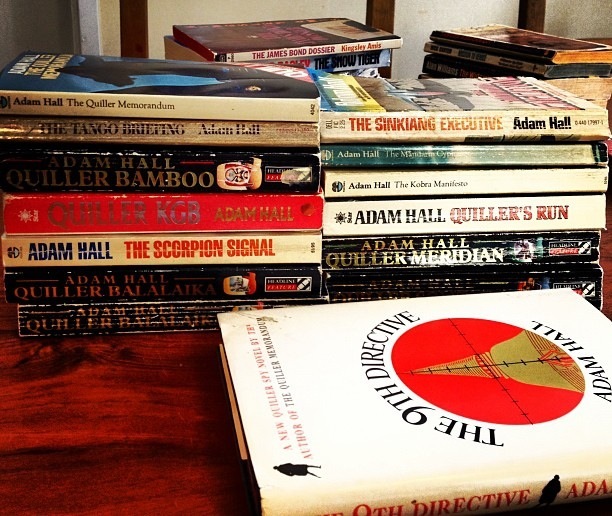 I'm reading Adam Hall's The Ninth Directive at the moment, which I believe is your favourite Quiller. Why is that, do you think? And when did you first read it? The Ninth Directive probably ties with The Tango Briefing for my favourite spy novel full stop. I read both in 2000, I think, one after the other. I love The Ninth Directive because it's both very pulpy in terms of plot – assassinate the assassin – but simultaneously seems extremely authentic. While reading the novel, you really believe that this is how a secret agent would think and act. It predates The Day of the Jackal by five years, but has much of that feeling of peeking inside a hidden world. I loved the way the target is never named, making it almost an elemental struggle to survive. Beyond that, I don't know... Sometimes you just connect with a book, or the voice of an author. I've connected with many, but with Adam Hall it was like a jolt of lightning through me. One thing that occurs to me as a possible reason for why you like The Ninth Directive is the setting: Thailand. You grew up partly in Asia – do you think that might be why the novel had such an impact on you? I've never been to Thailand but Hall's vivid description of the place strikes me as authentic. I guess part of my love of The Ninth Directive is due to the location, although I've never visited Thailand. Then again, I don't think Hall/Trevor had, either! I was surprised to read an interview with him in which he revealed that he very rarely wrote about locations he had visited, because he found he lost the magic when he did that. Quite an astonishing thing to do, really. For the most part I think it's impossible to tell, and he makes locations come alive. 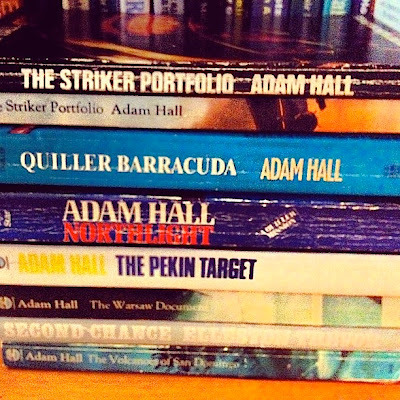 Hall was an expatriate for much of his life, so even in the Seventies some of his characters are from an England he had long left behind – as I've spent most of my life as an expatriate, perhaps I identified with that feeling in his writing as well. Which of the books you own are you most fond of? I'm guessing there might be a battered paperback or two you prize, so do please tell me about those. But are there any first editions you;re pleased to own? Am I right in thinking you own perhaps the scarcest Adam Hall book, the final Quiller, Quiller Balalaika? I own two copies of Quiller Balalaika, but they're less rare than when I bought them. I have a couple of first edition Quillers which are dear to me because they were gifts, but although I love books, and often love the designs of them and the feel of them, I'm not usually that sentimental about them as physical objects. I cherish books that have been given to me, and am lucky enough to have a few from other writers: The Bright Adventure by Geoffrey Rose, Lights in The Sky by Philip Purser, Silver by my friend Steven Savile... I sometimes pinch myself that I own these. All the books I got in that Antwerp shop were paperbacks, incidentally, as are both my editions of Balalaika (the same one, with the jacket art featuring Quiller holding, clanger of clangers, a gun). Most of my books are paperbacks, in fact. Something I just remembered is that I managed to persuade the editor of the magazine I worked for in Belgium to let me do a feature article on Pêle-Mêle, so I toddled off to interview the owner. And after we had chatted away for a bit he led me through locked doors down to the basement, where there was a whole room stacked floor to ceiling with second-hand English paperback thrillers – their overflow room. It was like Ali Baba's cave. So I didn't just clear out the shop of every last Household, Hall, Hone and so on, I also raided their secret stash. It was geektastic. Where do you usually write? Do you have a study at home in Stockholm? Yes, I have a small study that is basically a computer, a leather chair, a sofa-bed and several bookshelves. I have a few small objects about. Adam Hall's son sent me a Soviet militia badge a couple of years ago, and I quite often pick that up and fiddle with it. It's my executive toy! I'm assuming you write on a computer. Have you always done so? I actually wrote on a typewriter when I started out as a music journalist twenty years ago, and when I switched to a computer I found it changed the way I wrote – instead of writing from beginning to end, I'd write bits of an article and then sort of stitch it together. I guess what I'm asking here is, how do you write your novels? Plot them out? Write from start to finish and make it up as you go along? Or write bits from across the novel and put them together? I mainly write on a computer, and always have done, although I also carry a notebook with me to jot ideas down. I don't have a set method, but I do tend to write a short synopsis and that gives me a basic structure. I try to figure out what sort of mood I want the book to have, what kind of book I want it to be. With The Moscow Option, I knew going in that I wanted it to be set in the Soviet Union and the Åland archipelago, that it would take place in winter, and that it would involve the threat of nuclear war. I wanted the mood to be bleak, but frantic. I also had some ideas of set scenes, so I started writing them in basic form first and then worked from there – I wrote part of the ending first. My structure tends to change as I go along, as I discover that ideas I liked don't work or think of something better. I find if I've worked everything out too much in advance it starts to feel stale. I like to surprise myself, and that involves some tricks to keep myself on my toes. So it's a mix between planning in advance and improvising. Do you listen to music whilst writing? What, if so? Yes, I almost always write to music, as I find silence too imposing. I put a lot of thought and time into what music I write to, in fact. Some writers obsess about Moleskine notebooks or where they place their pencil sharpener, and I guess this is my little obsession. I find it difficult to write to music with lyrics, so I mainly listen to instrumental music, or music in which the lyrics are fairly minimal and so are less likely to distract me from my work. I love Leonard Cohen, for instance, but I wouldn't try to write while listening to him. I've got several playlists that are 200-400 songs long so I don't feel like I'm listening to a loop and I also refresh them quite frequently for that reason. The basis for most of them is electronica, often taken from compilation albums with 'Ibiza' or 'Chill' in the title. Particular favourites are Waiwan, The Flashbulb, Bliss, Snooze, and two collections called The Jazz House Sessions and Chill House Sensation, both of which sound absurd but which work very well for me. I find I'm enjoying the music, but can also stay sharply focussed. I also throw in some oddities, especially stuff from the Sixties that will help me feel like I've stumbled into the score of the book I'm writing: a few Emotions songs, some Persuaders, that sort of thing. Then I have some jazz – Grant Green and John Scofield – and this all helps make what, in my fevered mind, is an endless soundtrack. I'm imagining I'm the spy novel equivalent of David Holmes. I started this approach with my first novel, but have varied it since, trying out new music and adding quirks depending on the book. With Free Agent, I listened to a lot of afrobeat, some of which goes on for a long time and is quite meditative. In particular, Fela Kuti's early band Koola Lobitos helped me get into the mood of Nigeria in the late Sixties. I wore out a haunting Marvin Gaye song, Dark Side of the World, which was recorded at around the time the book is set but not released until fairly recently. Alice Russell's song Hurry On Now was an important song for me: it sounded like it was from the Sixties but gave a fresh twist to it, and I was trying to do something similar. I also listened to a lot of early Rolling Stones, Gimme Shelter and Play With Fire in particular: I wanted the book to feel like those songs. I found it interesting when I read an early draft of a screenplay for the BBC that the script began with Sympathy for the Devil playing over a Lagos traffic scene. It's such a simple idea, but of course that song is perfect for Paul Dark, and for the series as a whole in fact. For Song of Treason, I downloaded several albums of soundtrack music from Sixties Italian spy films, and mixed them in with my other music – a lot of Ennio Morricone and his contemporaries. I also listened to Eve of Destruction by Barry McGuire several hundred times – that was the key song for the book, an alternative title for it, and briefly features in it. For The Moscow Option, I listened to a lot of Sibelius – Finlandia comes up in the first two books and this one's the pay-off for that, as Dark is in Finland – as well as a lot of more recent spy scores. I love John Barry's work but can't write to him as I start imagining Sean Connery or Michael Caine or George Segal instead of Paul Dark. Ditto John Powell's work on the Bourne films. I realized that that sort of sound helped my writing, but I associated it too much with Jason Bourne. So I spent a few hours on iTunes, using the preview feature, buying individual songs from spy thriller scores. I picked a lot of films I haven't seen, so I know I have stuff on my playlists from The International, Shooter, Spy Game (which I've seen, but years ago) and several other films from the last couple of decades. But I don't look at the stereo when they play, and I have enough of them, on a long enough random-order playlist, that none of them ever push themselves to the forefront enough to stand out. So instead of being Track 4 from The International, Track 6 from Shooter and so on, they became part of the soundtrack to The Moscow Option. Just the other day I found a great album to fit in to my playlists for my current book: Themes for an Imaginary Film by Symmetry. It fits my purposes perfectly, and I've written a lot to it already. I realize that all makes me sound slightly mad, but when you want to write a book I think it's worth making yourself comfortable to do it. I spend some time setting up music so I don't have to think about what to listen to on a daily basis. Do you write on the move at all? Do you have a laptop? I don't have a laptop, though I sometimes use my wife's if we're travelling, and I also use a notebook. But most of my writing is done in my study at home. Do you have to stay away from the likes of Twitter and Facebook when you write, or are you able to dip into them as you write? It varies. I've gone off Facebook in the last year or so and don't use it all that much anymore, but I am an avid Tweeter. Sometimes I find that when I'm writing a lot I also tweet a lot, because I become almost hyperactive with ideas, and very flighty. But sometimes the opposite happens, and I just hunker down without any need to go online at all. On the other hand, I also find I can get overly distracted by the net, and to get work done I have to switch it off with Freedom – sometimes willpower isn't enough. It's something I wrestle with quite a bit, as I imagine many writers do now. Radio silence can recharge your creative energy, and can be vital. But interacting with people, reading articles and so on can also reinvigorate and inspire you. It's a balancing act. The most important thing is getting the work done. You do whatever it takes. You're right – it was tempting, and Philby was my first idea. I wrote several scenes featuring him, but abandoned them. The scene with Brezhnev near the start of the novel originally had Dark and Philby around the table. I also wrote a long scene with Dark in Philby's flat, and did a lot of research for it. There were several reasons I decided not to go with that idea. Some of them are to do with that logic – if I were in Dark's shoes, knowing what I knew of Philby and his career in Moscow, I wouldn't have risked appealing to him. I also found it very hard to do because although I feel like I can imagine Philby quite well, there are a lot of traps there. Philby has appeared in a lot of spy thrillers, either under his own name or loosely disguised. So now it's almost too obvious, and it kept ringing false to me. If I had the stutter it was cliched and almost parodic, but without it he didn't quite feel like Philby, and so on. I thought about it for several weeks, trying different things and doing some research, and eventually decided that Maclean was not just more likely, but more intriguing. I thought it was interesting that he had associated with dissidents in the way he did, and the small incident that forms the basis of Dark's appeal to him really happened. Most literature about the Cambridge spies centres on Philby and Burgess, but I found Maclean equally fascinating, partly because he's harder to read. He was a handsome man – you can imagine Rupert Everett playing him, I think – but towards the end of his life he became rather ghoulish looking. He also had a very screwed up relationship with his father, as of course Dark does. Philby did, too, but I thought it would be interesting to encounter someone who had done what Dark had done, a real historical figure who had lived with the consequences but who would also condemn Dark for his actions. I thought this would confuse our feelings about Dark more, in that you'd both see Maclean's point but also be on Dark's side – after all, we've come to know him while Maclean is a stranger, and one seen through Dark's eyes. But if we forgive Dark, why don't we forgive Maclean? Dark has done more damage. My motives weren't quite as clear-cut as that, perhaps, but this is the general area I was circling. 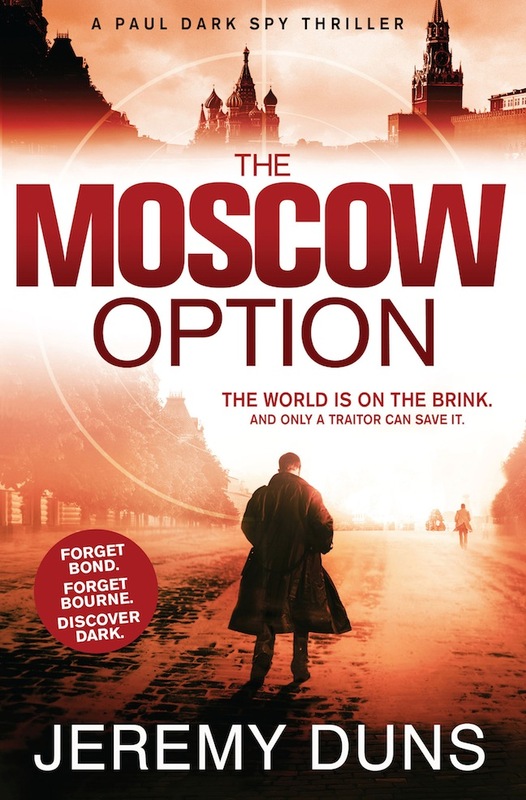 As with the two prior Paul Dark novels, the Author's Note at the back of The Moscow Option is most illuminating as regards the research you do for your novels and how you weave real events into them. But I have to say, The Moscow Option note is rather alarming, in particular what it reveals about President Nixon's "Madman Theory". And the novel as a whole often sees Paul ruminating on the nuclear nightmare he's trying to prevent. I vividly recall being terrified of nuclear war in the 1980s; did you have similar fears growing up? I'm glad you found that note alarming, because that's why I decided to use it. I remember the idea of nuclear war scaring me as a teenager, and of course that fear has faded with the end of the Cold War and the emergence of new threats, although the risk is perhaps greater today than it has ever been. Despite that, to most people nuclear war now seems an abstract idea: in thriller terms, we know the secret agent will defuse the warhead, but it means very little to us. But it meant something to me when I was fifteen or sixteen. So I wanted to bring back a thriller with those stakes, but I also wanted to remind or perhaps introduce people to what they really meant, and how fragile the situation was. I was lucky to come across a guy called Mike Kenner, who is a campaigner for freedom of information, and he very kindly shared with me thousands of documents he has managed to have declassified from the National Archives. A lot of these are from the British government's contingency plans for nuclear war during the Sixties, and they're chilling. So I used some of that information and the events of October 1969 to try to craft a thriller that recaptured some of the feel of the books I read growing up, by Frederick Forsyth and Desmond Bagley and others, but which I hoped would also hit home now because of the reality behind it. Last question: something you find with many writers of fiction is that they don't seem to read much fiction – when asked what they're reading, it's usually non-fiction. (This isn't always the case, of course; Kingsley Amis read a lot of fiction, especially genre fiction.) I guess that's partly down to not wishing to be influenced by other people's novels when writing your own, but I also suspect it's that 'busman's holiday' thing: when your 'job' is to write novels, reading them as well can seem a bit much. What do you think? I know you read a fair bit of non-fiction, but do you still read much fiction besides? What are you reading at the moment? Unfortunately, I fall into this camp – I hardly read any fiction these days. I'm reading Ordinary Thunderstorms by William Boyd at the moment, but it's one of the very few novels I've read recently. I'm always looking for new information to use in my books, and I find that much as I enjoy fiction it mainly contains lots of ideas I can't use. At the moment I'm writing my first non-fiction book, about Oleg Penkovsky and the Cuban Missile Crisis, and as a result I've read around a hundred non-fiction books for research in the last year – if you think my music selection sounds obsessive it doesn't even compare. I guess the busman's holiday comparison is right – for some reason, I often find it very difficult to read fiction now, and get antsy after a few pages. I happily listen to music and watch films, but when I'm reading a novel I become very conscious that I'm taking time away from creating my own books. For previous Existential Ennui interviews, click here for a Q&A with Christopher Nicole, alias Andrew York, author of the Jonas Wilde spy novels; here for short Q&A with Jeff Lindsay, author of the Dexter crime novels; and here and here for a two-part interview with Anthony Price, author of the David Audley spy novels. Fantastic interview. Well done. I enjoyed being reminded of Emil and the Detectives, which was a great favourite of mine as a boy. Also, nice to see Desmond Bagley, Duncan Kyle and of course the great John Christopher get mentioned! Duns seems like a really cool guy. Sounds like his work is continuing and developing a British fictional spy heritage that had been fading out for a bit. Glad to see he is part of a possible resurgence. Going to have to add his books to my list!